UNITED NATIONS, USA -- Ukraine wants the United Nations to brand Russia a terrorism sponsor amid bloody clashes between pro-Russian separatists and Ukrainian government troops. Ukraine Ambassador to UN, Yuriy Sergeyev. The Ukrainian ambassador to the UN told Fox News he plans to submit a draft resolution asking the UN General Assembly to formally label “Russia as a sponsor of terrorism." 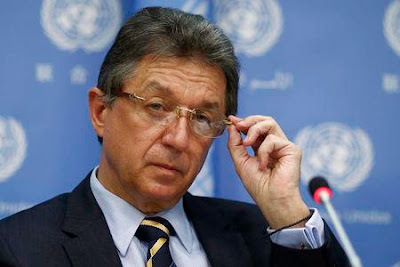 Ambassador Yuriy Sergeyev gave no timetable for when he would present the resolution to the UN. He said government officials in Kiev are working on the text. Ukraine and the West accuse Russia of backing the rebels with troops and weapons, which Russia denies. Meanwhile, artillery fire killed at least 12 civilians in the main rebel stronghold of Donetsk on Friday amid fierce fighting between pro-Russia separatists and government troops as hopes for a break in hostilities were dashed when an attempt to call a new round of peace talks failed. Five people were killed as they were waiting for humanitarian aid outside a community center and two people were killed in the same neighborhood when a mortar shell landed near a bus stop. By the time an Associated Press journalist arrived at the community center, the bodies were taken away. Nearby trees were cut down by what could have been a projectile. Five other people died Friday in sporadic artillery fire in the west of Donetsk. Full-blown fighting between the Russian-backed separatists and government forces erupted anew earlier this month following a period of relative tranquility.